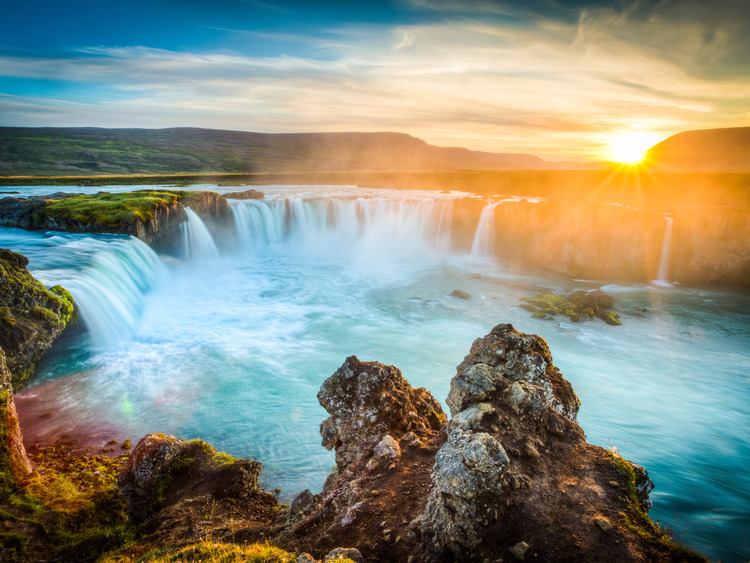 A thrilling tour over the natural beauty of the Diamond Circle, an area in north-east Iceland where some of the most spectacular sights on the island are located. We go on a flying tour to admire views of striking mystical beauty characterised by amazing natural geothermal phenomena. We fly over the superb *Godafoss waterfall, whose shape is reminiscent of the more famous Niagara falls even though it is only 22 metres high. We cross the heart of north-eastern Iceland - the Mývatn lake region, where lava rocks and volcanic formations create striking views. We continue our trip flying over the Vatnajökull glacier, the largest in Europe, as far as the Dettifoss waterfall which drops into a narrow canyon surrounded by a lunar landscape made up of rocks as far as the eye can see. We finally reach the spectacular Ásbyrgi canyon, an enormous lush horse-shoe shaped canyon that encloses a birch forest. We then bid goodbye the Icelandic hinterland and head back to Akureyri.